Due to the high cost of copper, new home builders are using polyvinyl chloride, or PVC; chlorinated polyvinyl chloride, or CPVC; and cross-linked polyethylene, or PEX, plastic tubing instead of copper in many plumbing applications. PVC is for drainage, while CPVC and PEX are for pipes carrying potable water. Metal pipes connect plumbing applications installed within 18 inches of hot water heater fittings. Retrofitting copper pipe with plastic requires a few tools but soldering expertise is not required. Sketch or photograph the plumbing you intend to replace before starting dis-assembly. This will provide a visual reference to follow when you begin the installation of the plastic pipe. Check the shutoff valve on the upstream side of your water meter to ensure it is operational. Repair or replace as necessary. Check the main ground wire leading from the electrical service panel. In many homes with metal plumbing, this wire connects to the cold water pipe. If this is the case in your home, call an electrician to install an outdoor ground rod, remove the ground wire attached to the cold water pipe and attach the grounding bus to the outdoor rod. Turn off the shutoff valve on the upstream side of your water meter. Turn on all the water taps in your home and allow all existing water in your copper pipes to drain away. 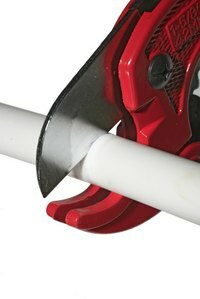 Cut out the copper pipe you are replacing using your Sawzall pipe cutter. Replace copper pipes with PVC, CPVC or PEX pipe of the same gauge and type as the copper pipe you are replacing. This could be one-half or three-fourths of an inch in diameter. PEX also comes in blue for cold water and red for hot water use. Clean the ends of straight lines of linked plastic pipe using plastic pipe cleaner, coat the ends with plastic pipe cement and slip one pipe into the next. Use an expansion tool to expand the pipe when necessary. Install brass fittings using the expansion tool. Crank the tool to expand the pipe, insert the pipe into the fitting and use the compression tool to crimp the fitting in place. Snug up the brass outer ring using the snugger on the compression tool. This will cover the joint between pipe and fitting for a clean, secure fit. Turn off all the opened water taps in your home after installing the new piping. Turn on the valve upstream of your water meter. Turn on the taps room by room to bleed any air in the lines. Turn the taps off as you go. Remove, clean or replace the filters on all of your faucets after shutting off the water supply and before removing and replacing your pipes. This will ensure a strong, clean flow through your new system. Try contacting a scrap metal dealer to sell your old copper piping. You may get some funds to offset some of the costs of your plumbing retrofit. Always use a licensed electrician to install the outside grounding rod and divert the grounding bus from your cold water line to the outside rod.